Anyone who knows me, knows that I love fantasy stories. I love dragons and unicorns and fairies and witches; elves and dungeons and wizards. The first little crochet toys I made was a set of adventurers. I still have them too. The Ogre, the Elf Archer, and the Wizard. But then I made a pair a Valentine baby booties and somehow ended up making a lot of baby headbands, booties, and diaper covers.Which is okay. They are cute and work up fast. And they made great baby shower gifts. But, my husband began wondering why I was making all this baby stuff without any nerdy flare. I said because I enjoy making things, and I was a bit scared. I didn't have the rights to copy any Star Wars, Avatar: the Last Airbender, or Lord of the Rings images into my work. I had heard stories of Etsy shops being shut down for selling "Jayne hats" and I didn't want to risk it.So I continued making safe, cute baby stuff. One: my library had a comic-con. I was on the planning committee. 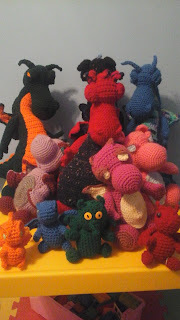 Two: a Facebook friend shared an image of one of Amigurumi's To Go finished Sleepy or Fierce Dragons and asked if I could make them for the con. Of course I could make those for the con! And I could do different sizes too. As you can see, my dragons are more little bit more fierce than hers, and not sleepy at all, as a proper dragon should be. But if you're two-years-old, that doesn't matter much. I loved making them too. 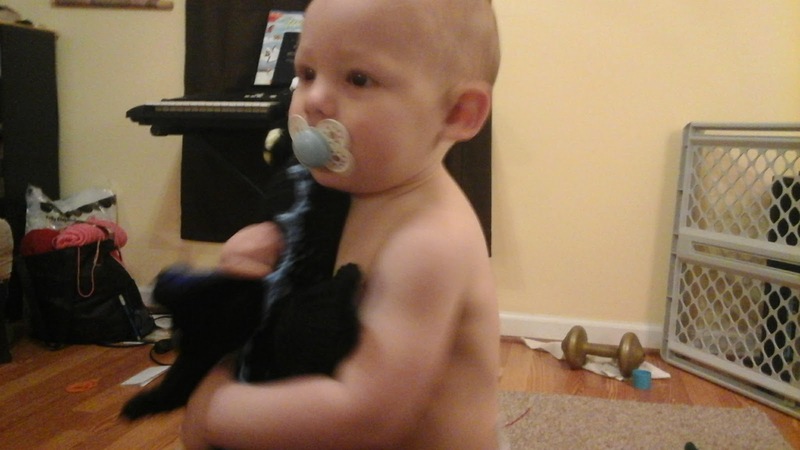 I also started creating my own dragon patterns for smaller versions. The formula is not perfected yet, because that involves writing things down. But I'm working on it. These guys are all in my Etsy shop right now. If you could visit them, I'd love to see some more hits on them. Dragons aren't the only fantastic creature I'm creating either. Soon there will be Kitsune, Unicorns, and possibly a fairy cat. I'm a mother of three, wife, crafter and bookworm. If this blog doesn't get updated often, it's because I'm trying to balance too many things at once.